Banks 1st returned to leech lake rez about 10yrs back, the community he was raised in had just initiated it’s annual traditional gathering after a 30 or so year lapse. Banks attended and wanted to be involved with the committee for the next season, one idea he had was for he and friends to cross a small lake in canoe’s singing with drum to land on the shore next to the gathering grounds to open up the ceremonies. After Banks realized all committee members and anyone affiliated with conducting the gathering was on a volunteer basis only, no contracts, no monies. Banks was not seen again, apparently he did not like the sweat equity, self determination, self worth, etc … concept the group was trying to enhance for the community. so much for giving back to the community eh? another interesting note is that 30 or so years prior, the community gatherings stopped because of lack of participation, older guys such as K. Smith & G. Thompson mentioned the main reason being was the youth (to include Banks) broke away from the elder guys such as Mr. Hurd and friends, and started ceremonies at the end of the community peninsula which according to their (Smith/Thompson) involvement amounted to drug and drinking (mid to late 60’s) lifestyle parties. A way of life the likes of Hurd and other community members held zero tolerance for. This was the years just prior to AIM organizing. 30 yrs later, the first gathering since the lapse, Mr. Hurd was still here and he drummed on his own, also had a 2nd big drum that year that did not return the following years (Banks supporters) , the 2nd year the main drum was a no show, so community kids gathered around a drum, this was their first sitting and Mr. Hurd helped them along, thou he still drummed on his own, a young girl in the community broke water at the strike of those kids singing that year 🙂 , 3rd and 4th years were progressive with Hurd still drumming at the gathering on his own 🙂 , while other drums showed up in support , the 4th yr gratitude to the participants (dancers,drummers) was shown with traditional food travel birch baskets, wild rice, hominy, cedar, sage, sweat grass, maple sugar cakes ect … in place of monies, In reference to modern day aspects of a pow wow, there was a bit more the older guys desired, they wanted the “wild west bill show, rodeo concepts” out. There was no grand entry, no parading of flags and no royalty concepts of putting one above the other. In the drum arbor, eating, cigarette smoking & foul language was not tolerated (respect). The MC was to be removed to rid the regimental drive of song and dance. The intent was to have 4 drums at any given time in the arbor, i.e to have the drum set the pace for song and dance in place of a ring leader (MC). This did not go over well with a few select community members (AIMster mentality types) who the next year joined hands with the local Indian council to conduct a powwow on the same weekend of the traditional gathering, so the traditional gathering group closed the gathering grounds that was on the forestry managed land , while the local Indian council continued on the baseball field, that year the council had a man come to the powwow and deem the forestry land gathering location as Evil. Even thou Banks never showed up again after the 1st year, his influence and the AIMster mentality for money over sharing still shaped the guys younger than him. The community gathering that was re-established on unity, sweat equity and fund raising ($4000/yr avg) transformed into a $40,000 weekend powwow funded by the reservation tribal council. The “pow wow” continues to this day and is based on financial wants and “individual” recognition. The world view’s of Mr. Hurd and those like him to include the women are still present , thou dwindling more and more as years pass on. The 4th year of the traditional gathering was Mr. Hurd’s last …. The Fires that initiated the Oshki-agojin Traditional Gatherings were closed out in ceremony in the 5th year, due to the Onigum Local Indian Council planning and conducting it’s 1st annual Onigum PowWow on the annual dates of the Oski-agojin Traditional Gathering …. This entry was posted on May 4, 2012 at 7:42 pm and is filed under Uncategorized. You can follow any responses to this entry through the RSS 2.0 feed. You can leave a response, or trackback from your own site. The gathering committee set the traditional gathering on forestry managed land because the gathering committee was informed by a forestry representative that if the community utilized the managed land for cultural development and maintained the land for 5 years, the land base would default back to the tribe as per forestry management agreements held with the tribe. The forestry wanted the committee to push the tribe for a land for land exchange to use the forestry managed land. The committee refused that idea because it was not necessary. The forestry even threatened to not allow the tribal members to have access to the managed land if the committee did not sign a land usage contract that would have nullified the original land management cultural use clauses; the committee refused the contract also and developed the gathering grounds. The initial land base for the gathering grounds was approx 6 acres. 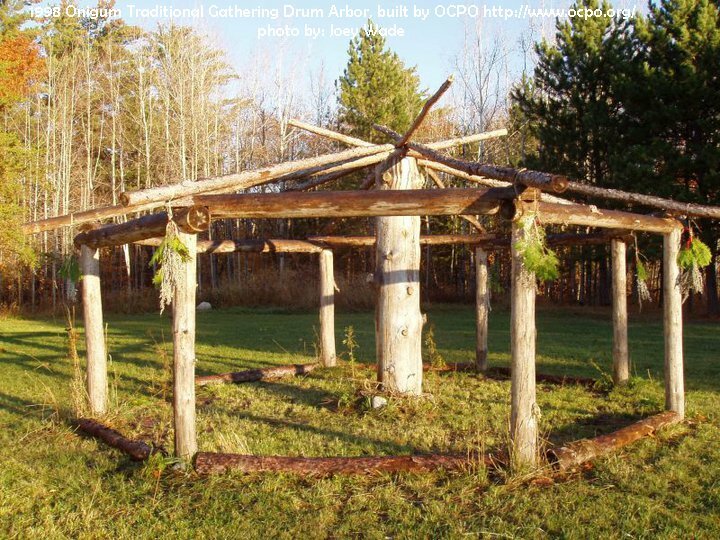 Had that land base been returned to the tribe because of cultural use, the committee’s intent was to append another strip of land to the gathering grounds to include learning camps such as survival living, language camp, maple syrup tapping camp, etc…. This strip of land would have stretched to the lake connecting to a shoreline area that was to be used for fishing/netting cultural programs. Loraine Beaulieau, George Thompson, Kenny Smith, Donna Powell, Jackie Burnett, Cherylin Martin-Wade and me. Volunteer help consisted of community youth who cleared and built the gathering grounds, helped with fund raising activities such as cake walks, cookie sales, raffles and organizing, conducting the gatherings.